Not long ago, Roman Reigns stepped away from WWE to battle leukaemia, the toughest opponent of his career. 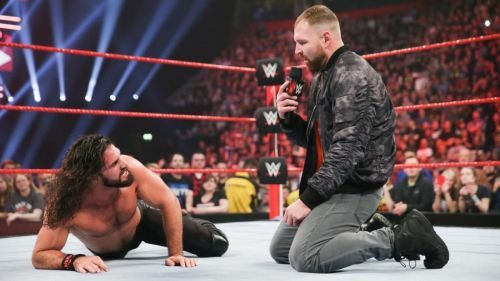 On the same night, his own Shield brother Dean Ambrose turned heel in what was perhaps the most shocking change of character in recent WWE programming. Rollins revealed Ambrose's motivation for going heel in an interview with 'The Show On Rock 105.3. Thank you to Wrestling Inc. for the quotes. Seth Rollins and Dean Ambrose took on Drew McIntyre and Dolph Ziggler for the RAW Tag Team Championships on the same night that Roman Reigns made his rather unfortunate announcement. The babyfaces would go over the heels, much to the delight of the WWE Universe. The excitement would be short lived as Ambrose would subsequently turn on Rollins. Ambrose and Rollins have been locked in a feud ever since that day. Ambrose has played mind games with the Kingslayer, causing him to lose his sanity. But at the end of the day, I understand why Ambrose did what he did on that night, in the sense that Roman was going to be gone. There was no if, and or buts that he was going to be gone. And so if you’re going to strike out on your own, you’re going to try and make a name for yourself, I understand to a point, doing it on that night. You’re going to make the biggest impact you can make, and if that’s your goal, if you’re saying your story is that The Shield has made you weak, and you kind of want to step out of the light so to speak, out of the shadows, that’s going to be the best time to do it. You’re going to have the most eyes on you that night, that moment, and you’re going to get the most people talking about it. Rollins and Ambrose are scheduled to be part of a huge Intercontinental Championship match at TLC. In the absence of a Universal Championship contest, this could be the match with all of the attention. Will there be a brand new Champion at TLC? Do you think Dean Ambrose could be the next WWE Intercontinental Champion? Let us know in the comments.